When I cut down a large Blue Spruce in my back yard, it was a task in itself. Once all the wood was bucked and the branches had been taken away I thought the job was complete. Unfortunately, there was still a massive stump and surface roots spreading through my yard. How do you get rid of a 1 tonne stump and surface roots without tearing a massive hole in the yard? The quick answer is: there are tons of options depending on how much time, money, and patience you have. Check out this list of ways to remove a stump, and decide for yourself which is the best. This is the cheapest option, yet not nearly the most effective. It requires multiple burns, breaking it apart to remove the remaining roots, and time. The reason it is so difficult to burn out a stump is it requires oxygen for wood to burn. With most of the stump being underground, air cannot circulate properly. This leaves an underwhelming slow burn of material that has a high moisture content. Once you have successfully finished burning the stump, digging up all the surface roots and disposing of them will be the final task, as burning them does not tend to be effective. For a person with plenty of energy and patience, this option is feasible. This job will require a shovel, pry bar, saws (or a chainsaw), lumber for leverage, or a pick-up with a sling. We do not recommend using chains or shackles as they can slip and sling-shot towards your vehicle, causing major damage. You will have to dig about 2-3 feet down around the stump and roots to cut all the roots away from the stump. There is normally a tap root at the base of the stump which will need to be cut as well. Once everything has been separated, you can use boards and a long pry bar or board for leverage to lift the stump out. As you lift, it is a good idea to back fill below the stump with soil so that it cannot settle back into the hole. Alternatively you can use a sling and a pick-up truck to slowly pull the stump out of the ground. During this step, it is important to make sure no roots are still attached as they can break and cause the stump to spring towards your vehicle causing damage. 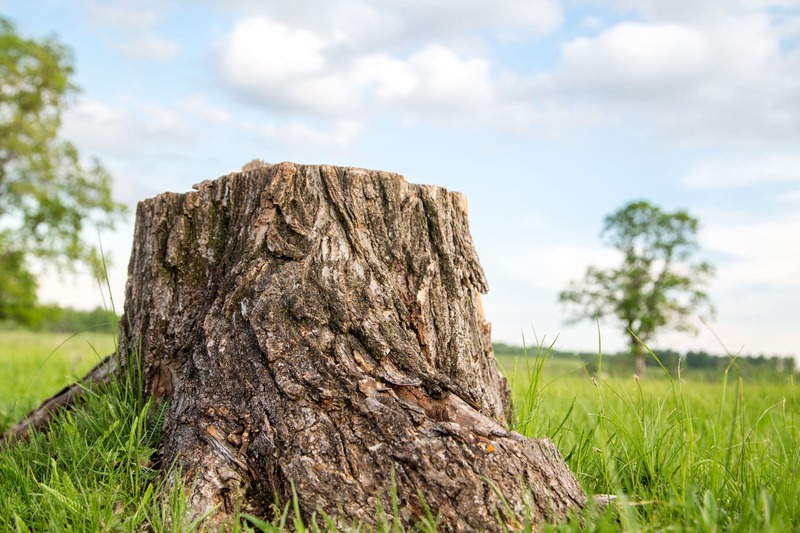 Once the stump is out of the ground, you should find a way to properly dispose of it before it becomes home to pests. Digging stumps out with an excavator or a bobcat can sometimes be the quickest way. Speed and cost are the biggest perks to this if you have the machines on site already. There are two main disadvantages to removal by excavators. The first is property damage. When a stump is pulled from the ground, all its surface roots lift grass, patio stone, and can damage walk ways. The second issue is what to do with the stump once it is out of the ground. The options are limited in the city, and most dump facilities will not take stumps because it is a wood and soil mix. If they do accept it, it will likely be at a premium charge. A stump grinder is a wheeled or tracked machine that comes in a broad range of sizes. Smaller machines running at 12 HP and up are great for getting into small areas with limited access, retaining walls, and gardens. Grinders work by taking small shavings of the stump with each pass, mixing the wood chips with the soil, and can go to depths as deep as 3 feet depending on the machine. The machines can easily be lifted by 2 operators and are efficient in grinding out stumps up to 20” in diameter and up to 12” in depth. Larger stump-grinding machines are still designed for urban use, so they have a narrow profile to drive through most fence gates. These machines do require a little bit more space to work and can handle stumps of any size. Grinders are light, easy to move, and remove stumps with very little turf damage. With the cost, labour and time invested in other methods of stump removal, stump grinding is the best choice in almost all urban areas.